Bu çalışmada Türkiye’deki İİBF’lerde okuyan üniversite öğrencilerinin sosyal medya kullanım davranışlarına ve motivasyonlarına göre sosyal medyada gerçekleştirdikleri faaliyetleri tespit etmek ve faktör yapısı altında ortaya çıkan faaliyetleri gerçekleştirmede farklı kümelerin oluşup oluşmadığını tespit etmek amaçlanmaktadır. Bu kapsamda Gazi Üniversitesi İktisadi ve İdari Bilimler Fakültesi lisans öğrencilerinden yüz yüze anket yöntemi ile elde edilen analize elverişli 995 kişinin verilerine Keşfedici Faktör Analizi ve K-ortalamalar Kümeleme Analizi uygulanmıştır. Yapılan analizler doğrultusunda, sosyal medya kullanıcı davranışlarını ölçen ölçeğe bağlı olarak araştırma kapsamında sosyal medya platformlarını kullanım davranışlarına göre üniversite öğrencilerinin altı farklı kümeye ayrıldığı ve bu kümelerin kendine has özelliklerinin olduğu bulunmuştur. Elde edilen kümeler “Yön Verenler”, “Oyun Sevdalıları”, “Çekimserler”, “Takipçiler”, “Paylaşımcılar” ve “Sosyalleşenler” olarak isimlendirilmiştir. Alikilic, O., Gulay, G., & Binbir, S. (2013). Kullanımlar ve Doyumlar Kuramı Çerçevesinde Facebook Uygulamalarının Incelenmesi: Yaşar Üniversitesi Öğrencileri Üzerine Bir Araştırma (Exploring Facebook Applications in the Framework of Uses and Grafitications Theory: A Survey among Students of Yasar University). Communication Theory & Research Journal, 37, 40-67. Blackshaw, P., & Nazzaro, M. (2006). Consumer-Generated Media (CGM) 101: Word-of-Mouth in the Age of the Web-Fortified Consumer. A Nielsen BuzzMetrics White Paper-2nd Edition. Spring, 1-13, New York. URL: http://www.nielsenonline.com/downloads/us/buzz/nbzm_wp_CGM101.pdf. Retrieved: March 14, 2016. Brandtzaeg, P. B. (2010). Towards a Unified Media User Typology (MUT): A Meta-Analysis and Review of the Research Literature on Media-User Typologies. Computers in Human Behavior, 26(5), 940-956. Brandtzaeg, P. B., & Heim, J. (2011). A Typology of Social Networking Sites Users. International Journal of Web Based Communities, 7(1), 28-51. Brocke, J., Richter, D., & Riemer, K. (2009). Motives for Using Social Network Sites (Snss) – An Analysis of SNS Adoption among Students. 22nd Bled eConference, 33-49, 14-17 June 2009, Bled, Slovenia. Bughin, J.R. (2007). How Companies Can Make the Most of User-Generated Content. The McKinsey Quarterly Report, 1-4, August, United Kingdom. Chi, H. H. (2011). Interactive Digital Advertising vs. Virtual Brand Community: Exploratory Study of User Motivation and Social Media Marketing Responses in Taiwan. Journal of Interactive Advertising, 12(1), 44-61. Constantinides, E. (2009). Social Media/Web 2.0 as Marketing Parameter: An Introduction. 8 th International Congress Marketing Trends, 1-25, 16-17 January 2009, Paris, France. Constantinides, E., & Fountain, S.J. (2008). Web 2.0: Conceptual Foundations and Marketing Issues. Journal of Direct, Data and Digital Marketing Practice, 9(3), 231-244. Celik, S. (2013). Kümeleme Analizi ile Sağlık Göstergelerine göre Türkiye’deki İllerin Sınıflandırılması (Classification of Provinces in Turkey According to Health Indicators by Cluster Analysis). Doğuş Üniversitesi Dergisi (Dogus University Journal), 14(2), 175-194. Daugherty, T., Eastin, M.S., & Bright, L. (2008). Exploring Consumer Motivations for Creating User-Generated Content. Journal of Interactive Advertising, 8(2), 16-25. Donath, J., & Boyd, D. (2004). Public Displays of Connection. BT Technology Journal, 22(4), 71- 82. Goffman, E. (2009). Günlük Yaşamda Benliğin Sunumu (The Presentation of Self in Everyday Life). B. Cezar (Trans.). Istanbul: Metis Publications. Dever, A. (2014). Sosyolojik Bir Teori Olarak Dramaturjik Teorinin Futbola Uygulanması (The Implementation to Football of Dramaturgical Theory as a Sociological Theory). Uluslararası Sosyal Araştırmalar Dergisi (The Journal of International Social Research), 7(32), 372-381. Hair, J. F. Jr., Black, W. C., Babin, B.J., & Anderson, R.E. (2014). Multivariate Data Analysis-7th Edition. Upper Saddle River, NJ: Pearson Publications. Johnson, T. J., & Kaye, B. K. (2003). Around the World Wide Web in 80 Ways: How Motives for Going Online are Linked to Internet Activities among Politically Interested Internet Users. Social Science Computer Review, 21(3), 304-325. Jung, T., Youn, H., & McClung, S. (2007). Motivations and Self-Presentation Strategies on Korean-Based “Cyworld” Weblog Format Personal Homepages. CyberPsychology & Behavior, 10(1), 24-31. Karahasan, F. (2014). Taşlar Yerinden Oynarken Dijital Pazarlamanın Kuralları-3. Baskı). (Rules of Digital Marketing while Playing Stones From Place-3rd Edition). Istanbul: Ceo Plus Publications. Katz, E. (1959). Mass Communications Research and the Study of Popular Culture: An Editorial Note on a Possible Future for This Journal. Studies in Public Communication, 2, 1-6. Kietzmann, J. H., Silvestre, B. S., McCarthy, I. P., & Pitt, L. F. (2012). Unpacking the Social Media Phenomenon: Towards a Research Agenda. Journal of Public Affairs, 12(2), 109- 119. Kim, Y., Sohn, D., & Choi, S. M. (2011). Cultural Difference in Motivations for Using Social Network Sites: A Comparative Study of American and Korean College Students. Computers in Human Behavior, 27(1), 365–372. Kim, D. J., Yue, K. B., Hall, S. P., & Gates, T. (2009). Global Diffusion of the Internet XV: Web 2.0 Technologies, Principles, and Applications: A Conceptual Framework from Technology Push and Demand Pull Perspective. Communications of the Association for Information Systems, 24(1), 657-672. Ko, H., Cho, C. H., & Roberts, M. S. (2005). Internet Uses and Gratifications: A Structural Equation Model of Interactive Advertising. Journal of Advertising, 34(2), 57-70. Kollock, P. (1999). The Economies of Online Cooperation: Gifts and Public Goods in Cyberspace. M. A. Smith, P. Kollock (Eds). Communities in Cyberspace-1st Edition. London: Routledge Publications. Krishnamurthy, S., & Dou, W. (2008). Note from Special Issue Editors: Advertising with User-Generated Content: A Framework and Research Agenda. Journal of Interactive Advertising, 8(2), 1-4. Kurtulus, S., Ozkan, E., & Ozturk, S. (2015). How Do Social Media Users in Turkey Differ in Terms of Their Use Habits and Preferences? International Journal of Business and Information, 10(3), 337-364. LaRose, R., & Eastin, M. S. (2004). A Social Cognitive Theory of Internet Uses and Gratifications: Toward a New Model of Media Attendance. Journal of Broadcasting & Electronic Media, 48(3), 358-377. Lee, C. S., & Ma, L. (2012). News Sharing in Social Media: The Effect of Gratifications and Prior Experience. Computers in Human Behaviour, 28(2), 331-339. Lull, J. (2001). Medya, İletişim, Kültür (Media, Communication, Culture). N. Gungor (Trans.). Ankara: Vadi Publications. McKenna, K. Y. A., & Bargh, J. A. (1999). Causes and Consequences of Social Interaction on the Internet: A Conceptual Framework. Media Psychology, 1(3), 249-269. McQuail, D. (2005). Mcquail’s Mass Communication Theory-5th Edition. Great Britain: Sage Publications. McQuail, D., & Windahl, S. (1997). Kitle İletişim Modelleri (Communication Models). K. Yumlu (Trans.). Ankara: Imge Publications. Murugesan, S. (2007). Understanding Web 2.0. IT Professional, 9(4), 34-41. Nov, O., Naaman, M., & Ye, C. (2008). What Drives Content Tagging: The Case of Photos on Flickr. 26th CHI Conference on Human Factors in Computing Systems, 1097-1100, 5-10 April 2008, Florence, Italy. Park, N., Kee, K. F., & Valenzuela, S. (2009). Being Immersed in Social Networking Environment: Facebook Groups, Uses and Gratifications, and Social Outcomes. CyberPsychology & Behavior, 12(6), 729- 733. Quan-Haase, A., & Young, A.L. (2010). Uses and Gratifications of Social Media: A Comparison of Facebook and Instant Messaging. Bulletin of Science, Technology & Society, 30(5), 350-361. Raacke, J., & Bonds-Raacke, J. (2008). Myspace and Facebook: Applying the Uses and Gratifications Theory to Exploring Friend-Networking Sites. CyberPsychology & Behavior, 11(2), 169-174. Rheingold, H. (1993). The Virtual Community: Homesteading on the Electronic Frontier. Massachusetts: Addison-Wesley Publications. Ridings, C. M., & Gefen, D. (2004). Virtual Community Attraction: Why People Hang Out Online. Journal of Computer-Mediated Communication, 10(1). Shao, G. (2009). Understanding the Appeal of User-Generated Media: A Uses and Gratification Perspective. Internet Research, 19(1), 7-25. Severin, W. J., & Tankard, J. W. (1994). İletişim Kuramları: Kökenleri, Yöntemleri ve Kitle İletişim Araçlarında Kullanımları (Communication Theories: Origins, Methods, and Uses in the Mass Media). A. A. Bir, N.S. Sever (Trans.). Eskisehir: Anadolu University Publications. Stafford, T. F., Stafford, M. R., & Schkade, L. L. (2004). Determining Uses and Gratifications for the Internet. Decision Sciences, 35(2), 259-288. Swann, W. B. (1983). Self-Verification: Bringing Social Reality into Harmony with the Self. J. Suls, A. G. Greenwald (Eds.). Psychological Perspectives on the Self, 2, 33-66. NJ: Psychology Press. Tossberg, A. (2000). Swingers, Singers and Born-Again Christians: An Investigation of the Uses and Gratifications of Internet-Relay Chat, Master’s Thesis, Iowa State University, Ames, IA. Urista, M. A., Dong, Q., & Day, K. D. (2009). Explaining Why Young Adults Use Myspace and Facebook through Uses and Gratifications Theory. Human Communication, 12(2), 215-229. Wolf, M. (1999). The Entertainment Economy: How Mega-Media Forces Are Transforming Our Lives. New York: Crown Publications. Varnali, K. (2013). Dijital Tutulma-2. Baskı) (Digital Eclipse-2nd Edition). Istanbul: MediaCat Publications. Yamane, T. (2001). Temel Örnekleme Yöntemleri (Elementary Sampling Theory). A. Esin, M.A. Bakir, C. Aydin, E. Gurbuzsel (Trans.). Istanbul: Literatur Publications. https://www.forrester.com/report/Introducing+The+New+Social+Technographics/-/ERES56291. (Forrester Research, 2011). Retrieved: November 17, 2015.
http://www.gravity7.com/G7_SID_case_myspace_v2.pdf. Retrieved: January 14, 2016.
https://wearesocial.com/uk/special-reports/digital-in-2016. Retrieved: March 8, 2016. ISNAD ÖZLÜ, Müge , KALYONCUOĞLU, Selma . "Grouping University Students According to Their Social Media Usage Behaviours". 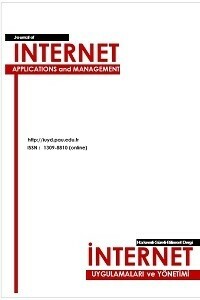 Journal of Internet Applications and Management 8 / 2 (December 2017): 5-29.